Njoy King Review - A Next Generation E-Cig With Amazing Design! 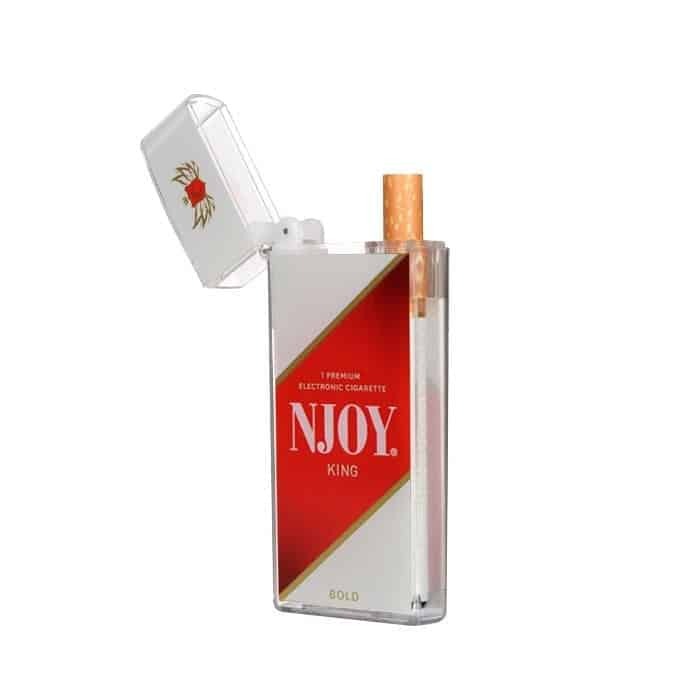 Njoy is a celebrated brand in the e-cig industry. Not only do they hold a huge share in the e cig industry but the company itself is privately owned. Even though their exact net worth has never been made public, we can bet on them being worth almost a billion dollars. One clear evidence of their huge success is the fact they have their products available in well over 100, 000 stores. Until late 2014, Njoy didn’t have an e-commerce extension. But their entry into this space has been phenomenal in terms of sales and this can be attributed to their quality products and fair pricing. Njoy King is one great example, a next generation e-cigarette that took the e cig market by storm. Vaping with the Njoy King feels like the real act of smoking. It’s a discreet device packed with rich flavors and everything else a vaper needs to be happy. With Njoy, you are entitled to a one-year warranty plus free shipping but that’s only if you buy the product from an authorized dealer. And if the product doesn’t excite you, you have up to 30 days to return it and have your money back. Be sure to check out the rest of our Njoy king e-cig review for what’s good and ugly about this e-cig. Let's begin this Njoy review - shall we? Once you open it, the first thing that will strike you is the ingeniousness behind the packaging. Its case comes in the shape of a Zippo lighter including the flip-top lid. On first impression, the company wins hands down. Interestingly, its unique thin and light design is protected as an intellectual property. Quality-wise, the casing is strong enough to withstand moderate punishments but not a heavy smash while the e-cigs have been created with attention to comfort and performance. Vapor production is decent, even with its small battery. Presence of high nicotine strengths contributes to the vapor production and for the flavor, you have a choice of two, which may look a bit mean but the good thing is that two are excellently executed to leave you completely satisfied. You can choose between traditional (tobacco) and menthol flavors. Battery performance is where the Njoy e-cig fails to match up to expectations. If you are a moderate or heavy smoker, you are likely to be disappointed by its shorter life. Going for regular replacements can turn out expensive but in spite of all that, it still does its job fine when it comes to vapor production as you will see later in this Njoy King review. Just by looking at its design, it’s clear that the Njoy King was made for that person trying so bad to quit smoking but wants an alternative that doesn’t feel so different. In terms of size, it’s almost similar to a real cigarette. It comes with a soft filter tip and on its body, it has on a paper complete with some rings just to make it look as close to a real cigarette as possible. Njoy lets their customers take advantage of a recycling scheme which applies to disposables such as the Njoy King. If you have a total of 8 used Njoy King e-cigs, just pack and send them back to the company and you will get a free e-cig in exchange for that. If you are a heavy smoker, this should be something to smile about. On top of that, there’s a referral scheme in which you get a 10% discount for your next purchase if you refer someone else to them. You can get an additional 10% off if you refer your friends but only for the first purchase. Since the unit itself is small, the atomizer too can’t be any bigger. To many, a small atomizer means less vapor production but Njoy King compensates for that with the high nicotine concentration in some of their e-liquids. So for each puff, you are definitely set to get a decent vapor but only if you use an e-liquid of high nicotine strength. One amazing thing about disposable cigarettes is that using them is as simple as using a real cigarette. This is unlike a rechargeable cigarette which you have to assemble and test out a couple of settings to adjust it to perfection. Every aspect featured on the Njoy King e-cig has been fine-tuned to look close to a real tobacco. So just the same way you would pick a tobacco cigarette, light it up and start to puff is the same way you would do with this unit. Before you make a decision to get this unit, this is a fact you have to keep in mind. It has a short battery life. But just exactly how long does it last? Please watch the video below to get the correct answer. Looking at its small size, this might actually make some sense. If the battery dies, you’ll have to fork out some few dollars for another so if you are a heavy smoker, this might not sound like a cool idea. It’s just so expensive. It’s a fact that the Njoy e-cig boasts a responsive battery and an exceptional sleek appearance but that doesn’t position it as perfect. According to some enthusiastic vapers, the run time isn’t uniform for each of the cigarettes. Sometimes, one will run out quicker than the other which points to some inconsistencies in the manufacturing process. Thankfully, you have a one year warranty plus a 30-day money back guarantee to your advantage should it turn out that unit disappointed you. How this unit is packaged is enough to make you want to own it. In fact, if you relish those little Zippo lighters, you definitely won’t have a second thought on buying this disposable cigarette. Due to their slim size, you will enjoy that you can easily slide them in your pocket or easily keep them in your small purse. The container itself is strong and unless you smash it against a wall or hit it with a hammer, it’s certainly going to last long. Just like a cigarette packing, the container has diagonal stripes running across it and colored based on the cigarette’s flavor as well as the nicotine strength. Like a Zippo lighter, the lid flips open by means of a click and inside the package, there’s a small information sheet to educate you a little bit about e-cigs and other relevant information. 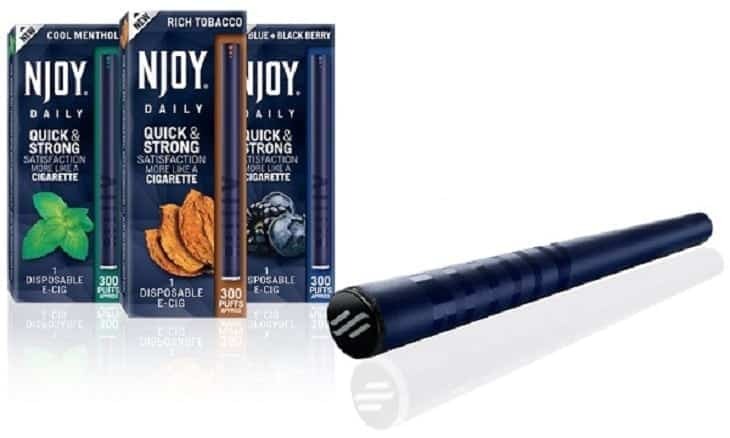 Njoy rechargeable e-cigs have up to four nicotine strengths. If you are new to vaping but a heavy smoker, the nicotine levels will suit your best. But are Njoy cigarettes bad for you if you are out to cut down your nicotine consumption? Well, most probably. Much as you only have two flavor choices, the traditional and menthol, make no mistake about their potential. Each of them is excellently executed. In fact, the traditional flavor basically replicates tobacco and it’s the closest you will ever to get to that real tobacco feeling. Menthol, on the other hand, comes with a twinge of mint putting it as a close as possible to that real flavor associated with a menthol cigarette. The relatively small battery doesn’t let it down either. It may be small but when it comes to vapor production, that size won’t matter. Vapor volume is decent, almost similar to that you get from the actual smoking itself. Addition of high nicotine levels adds to the unit’s remarkable throat hit and even as you puff, the huge clouds that will come out will be sure to leave you satisfied. What’s clear from our Njoy review is that the Njoy King is probably the finest imitation of an analog cigarette. That’s itself a noteworthy achievement and something that those trying to quit smoking but need a close alternative will be happy to discover. Design elements like the imitation of a Zippo Lighter and flip top case also make it feel so natural and just right for anyone who wants an e cigarette not far off from a real cigarette. Vapor wise, taste wise, and throat hit wise, the Njoy King doesn’t disappoint either. Adding on its sleek appearance and small size, that makes it an extremely competitive e-cigarette. Over the years, Njoy has scaled down the prices for this e-cig. Initially, they cost $8.99/unit but if you opt to buy in bulk, you are going to pay as low as $5.25. Even if you aren’t able to get yourself 100 at a time, there’s still a pack of 5 just for your sake. Click here to check out their prices. Our only hope is that in future, Njoy should look into making this device’s battery a bit more powerful, something every Njoy.com review agrees with. The battery should be made to last a couple of days and at the same time, the company should refine their quality control measures to ensure that their Njoy electronic cigarettes are consistent in performance.